Like what You’ve read? 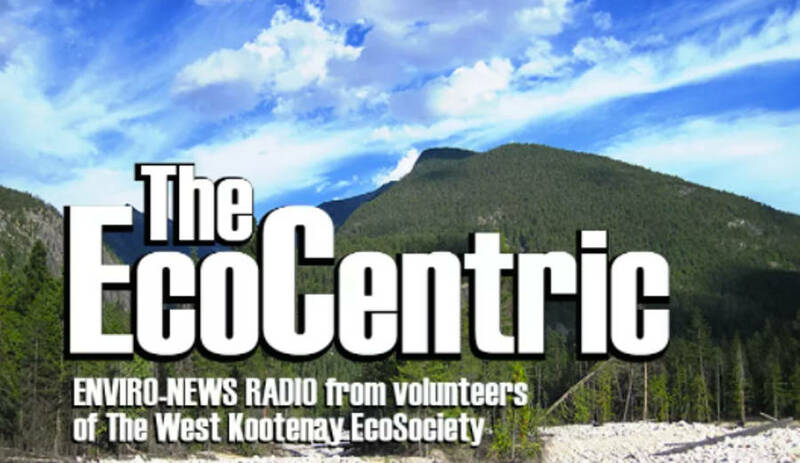 Listen to the EcoCentric’s downloadable podcasts. The Regional District of Central Kootenay could ultimately play a role in restoring salmon to the Columbia River system, which is why the Okanagan Nation Alliance sent a delegation to Nelson last week to encourage government officials to help them work towards a green light. The Salmon are blocked from reaching Canada by a series of dams, On the Columbia but work has already begun to build systems that will help coax them back upstream. Successfully getting them all the way into the Kootenays will likely involve the renegotiation of the Columbia River Treaty between the U.S. and Canada, a gargantuan task that is looming in the years to come. France is insisting that climate change have a veto in trade regulation it came out this week. France says it will refuse to ratify the Comprehensive Economic and Trade Agreement (CETA) between the European Union and Canada without a guarantee that the massive deal won’t conflict with policies and regulations to address climate change. Environmentalists have “raised concerns over whether powerful multinationals would sue governments over environment and health regulations, and their ability to use this clause for leverage to pressure governments against environmental measures,” UN Climate Action notes. That concern was affirmed by an independent expert commission established by France’s new government in June. On Monday, Oct. 23, Kalesinikoff Lumber presented their plan for logging in the Selous Creek area at Nelson city council’s committee of the whole meeting. The plan is for selective tree harvesting to cull Douglas fir beetle kiled trees in the Selous Creek drainage. Selous Creek is a secondary water source for Nelson. The City wants precautions to be taken to ensure that logging does not stimulate soil erosion in the area. This is critical as erosion could lead to siltation in the creek, which could have huge impact on the treatment the Interior Health Authority requires Nelson to provide for its drinking water. Currently, Nelson’s water supply has such a low level of particulate that expensive filtration is not required (chlorination and UV treatment suffice to provide an excellent drinking water quality). Environmental pollution — from filthy air to contaminated water — is killing more people every year than all war and violence. More than smoking, hunger or natural disasters. More than AIDS, tuberculosis and malaria combined. One of out every six premature deaths in the world in 2015 — about nine million — was attributed to disease from toxic exposure, according to a major study released Thursday in the Lancet medical journal. The financial cost from pollution-related death, sickness and welfare is equally massive, the report says, costing some $4.6 trillion in annual losses — or about 6.2 per cent of the global economy. The 2017 fire season is officially the worst fire season on record in the Southeast BC region. Last week the total number of hectares burned in one year beat the previous 2003 record. According to Southeast Fire Centre data, the total hectares burned this year bumped up to 88,911 heading into October, just over the previous worst year in history for the region in 2003 when 88,697 ha. were burned. However, the Southeast season saw fewer fires (368) this year — 279 were lightning-caused and the rest were caused by people (89) — compared to 635 fires of 2003. Other busy years include 1967 when 933 fires burned 25,904 ha., and 1971 when 556 fires burned 52,531 ha. It was a very challenging season in the West Kootenay as well as across the province with the extremely hot and dry conditions prevailing for so many weeks, creating fertile conditions for wildfires. It became a record heat and drought summer but the season started well below normal, the offspring of a very cold and wet spring. Climate change didn’t directly cause major wildfires in Alberta and British Columbia this year but it did contribute to their extreme nature, says a University of Alberta researcher. B.C. recorded its worst-ever fire season. Wildfires that began in early April scorched just over 12,000 square kilometres of timber, bush and grassland and at their height forced 45,000 people from their homes. Last month, Waterton Lakes National Park was evacuated after lightning sparked a blaze just inside the B.C. boundary. The flames eventually crossed into the park in southwestern Alberta. And this last week, wind-whipped grass fires quickly spread and threatened communities in a swath stretching from the Crowsnest Pass in southwestern Alberta all the way into Saskatchewan. Nuclear power is fading fast in the U.S. and Canada. A recent article in the Bulletin of Atomic Scientists tracks the failure of a major two-reactor project. South Carolina Electric & Gas spent about $9 billion on the project before abandoning it in late July after an analysis showed that it would cost at least $21 billion—about twice the original estimate. The project failure triggered the bankruptcy of the reactors builder Westinghouse and the near-bankruptcy of its corporate parent (Toshiba). The only other current nuclear project in the U.S. the Vogtle nuclear plant in Georgia is still under construction. But it faces many of the same problems as the South Carolina reactors—and there is growing opposition to their completion, with a final price that has risen to nearly $28 billion. Due to this year’s record-breaking wildfire season, the moose population was heavily impacted in the Cariboo region of Northern B.C. Now the provincial government has announced two areas of the Cariboo Region will be closed to moose hunting for the October 15th to 31st and November 1st to 15th seasons of 2017. Over 3 years ago the First Nations warned the BC Gov’t of a need of a ban. First Nations critics and others say it will take a 3 year plus ban to recover the moose population was 10 years ago. Others say that although the fires have hurt the moose, the pressure to issue more and more hunting tags is the main clause. The small First Nation community of ?Esdilagh in Quesnel, B.C., has declared a ban on harvesting moose within its traditional territory, in a move, it says, addresses gaps in the provincial government’s response. The First Nation says moose populations in the territory are already at an unprecedented low level. Last week the provincial government warned salmon farming company Marine Harvest Canada it cannot count on renewal of its decades-old tenures for open water salmon pens. The Oct. 13 letter to Marine Harvest Canada says the NDP government is committed to implementing the United Nations Declaration on the Rights of Indigenous People (UNDRIP), which includes the requirement that natural resources are developed with the free, prior and informed consent of First Nations. The company restocked its fish farms in the Broughton Archipelago on Oct. 13 over the objections of the local First Nations – and against the wishes of the provincial government. “Whatever operational decisions you should choose to make, the Province retains all of its rights under the current tenure agreements, including potentially the requirement that you return possession of tenured sites at the end of the current terms,” the letter from Agriculture Minister Lana Popham states. This week the Washington Post reported that estimates have put rates of global insect biomass loss at 50 percent or less. But Between 1989 and 2016, according to a report published last week in the journal PLOS One, the biomass of flying insects captured in several German nature preserves decreased by a seasonal average of 76 percent. John Losey, an entomologist at Cornell University in New York who was not involved with this study, said he was impressed by the scope of the new research across time, space and habitat range. Insects were collected at 63 locations in Germany, including grasslands, swamps, sand dunes, wastelands, shrubland and along the margins of human settlement.